The feminist organisation Mittika, in collaboration with Oxfam India, organised an interactive session called ‘Festival of Voices’ in Miranda House. The Women’s Development Cell of Miranda House organised an interactive session with students who identified themselves as feminists with Mittika (in collaboration with Oxfam India), a Delhi-based organisation on 5th October 2018. Mittika, which claims to work for “enriching life spaces” is primarily a research and advocacy organisation that works through on-ground direct intervention, disseminating knowledge and information, and by building stakeholder capacities. The session witnessed two representatives from the organisation, Radhika and Saransh, coming forward to encourage conversations between the audience members about various narratives surrounding experiences of women living in Delhi. In her own words, Radhika said, “I am here not just as a representative of Mittika, but to share my experience of what it means to be in the city and what it means to be a Delhite.” The conversation that flowed from there was informal, spontaneous, and largely audience-driven. The audience talked about the various ways in which the city was liberating in terms of providing spaces to wear clothes that they wanted to, have conversations on topics that would be otherwise uncomfortable such as gay rights, and also escaping the often stifling atmosphere of their families and hometowns. “I have been in a boarding school since fifth grade so I have been independent, but living alone brings its own challenges. The metro stations were initially very confusing, however with help of fellow commuters I learned to navigate across the city. Living in a flat also gave me the freedom to wear shorts and over the months I have gained confidence to call out people who just can’t stop staring,” said Khushali Jaiswal, a student from Miranda House. “Even in our families, little things like the Satyanarayan puja which was only to be performed by boys, can be very patriarchal, now, after coming here, I understand this,” said Manishi Divya, another student from Miranda House. The conversation then flowed into related topics like politics, protest culture in the university, and the recent instances of sexual harassment such as the Brett Kavanaugh case, the Tanushree Dutta allegations, as well as those made against Utsav Chakravarty. DU Beat talked to Tanvi and Shambhavi, both Economics students from Ramjas College who had attended the event. “It was good to know that a lot of people think the way I think. 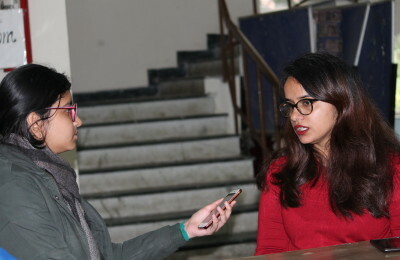 The atmosphere in Miranda is very open and engaging and we usually don’t have such conversations in Ramjas,” Tanvi said. “This session is a testament to the fact that when women are in a safe space, they slowly reveal how they feel harassed or discriminated against, even at the hands of their family or a cab driver. We need these spaces to encourage dialogue and build a sense of solidarity,” said Simran Pachar, a third-year Political Science student from Miranda House, as the event concluded with a group photo.